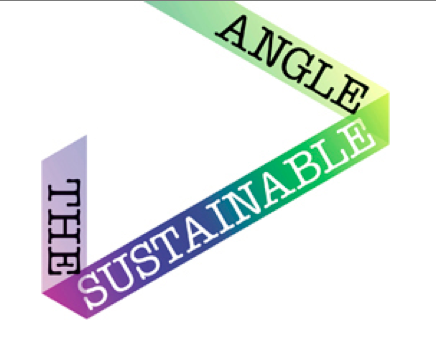 Held in London College of Fashion’s Oxford street campus on the 29th and 30th of November, the Future Fabrics Expo organised by Sustainable Angle showcased a wide selection of fabrics with environmental sustainability at the centre of their design. 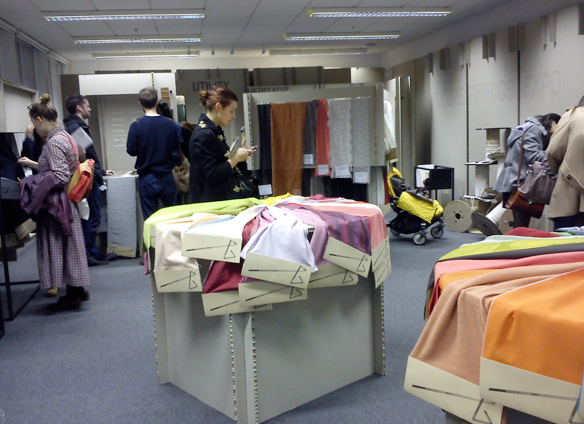 With around 400 fabric samples from 53 production companies and suppliers, the Expo was one of the biggest exhibitions of its kind. 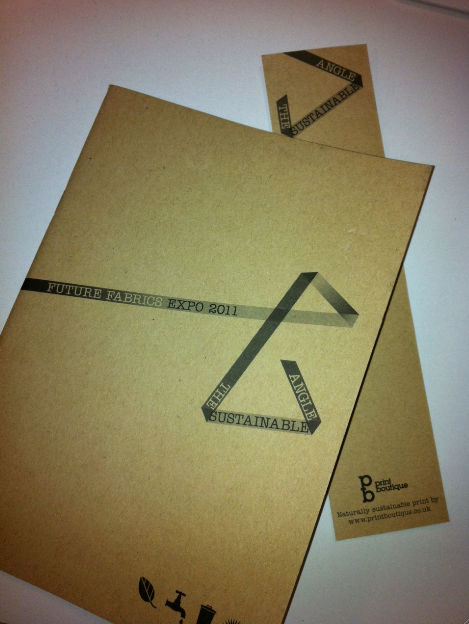 Designers, students and buyers alike came to see for themselves the new options available for improving sustainability across the supply chain. 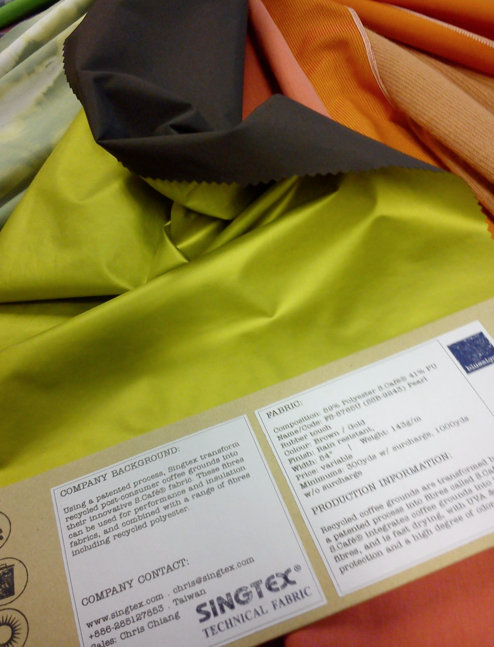 Although it was an initial guideline to focus on woven fabrics, we showed a sizeable range of knitted fabrics also as we were sent many which met our environmental and quality criteria, suitable for mid to high end fashion companies. 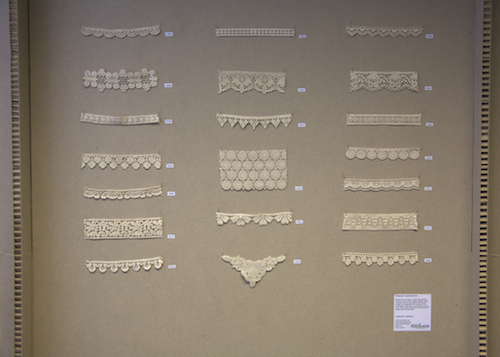 The exhibition aimed to show the exciting new possibilities ahead and it certainly did with fabrics such as Singtex’s S.Cafe® fabric, made from recycled post-consumer coffee grounds, and Paper no9’s leather made from recycled paper. 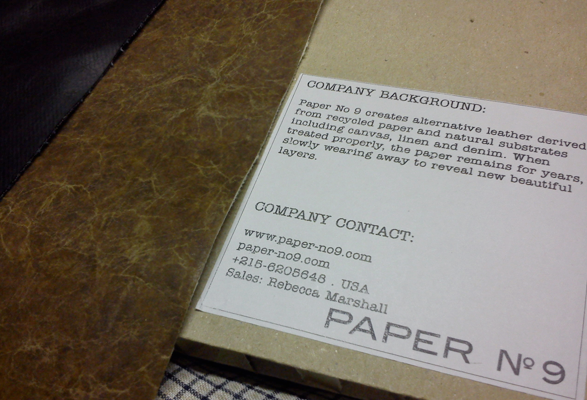 It was amazing to see the variety of textures that could be made from these recycled materials. 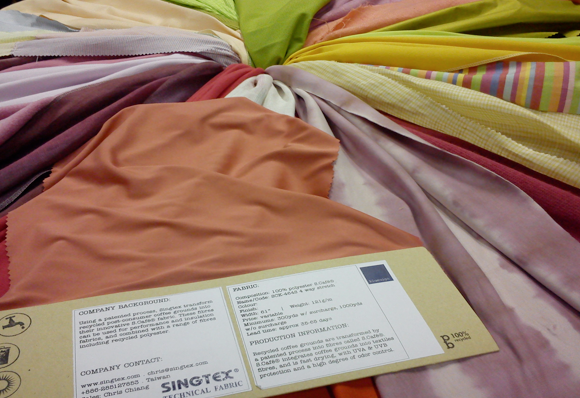 From the same S.Cafe® fabric, Singtex have made these astoundingly different fabrics. 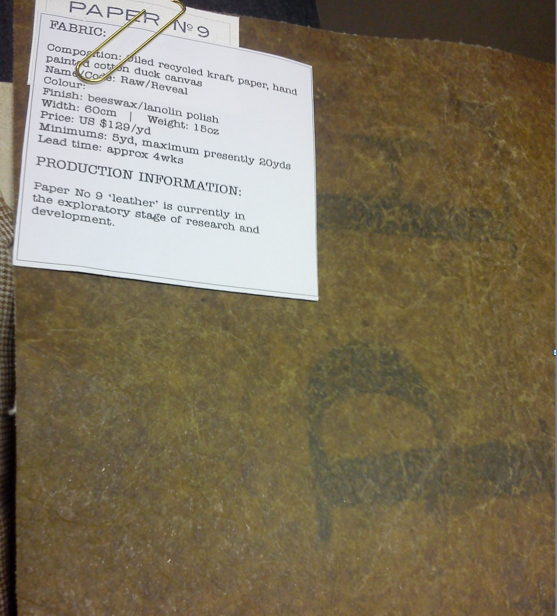 And Paper no9’s leather is also incredibly innovative, when treated properly it can last for years, slowly wearing away to show new layers. 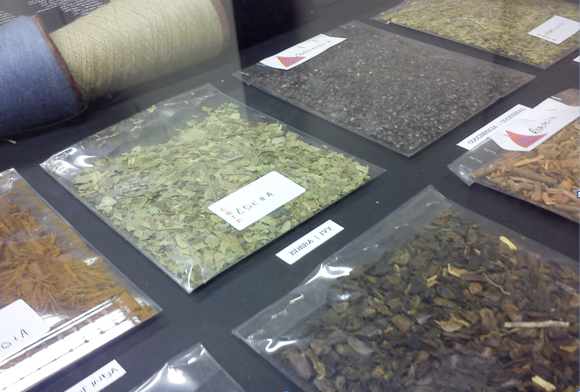 There was also a large variety of organic cottons and bamboo mixes as well as denims and knits. 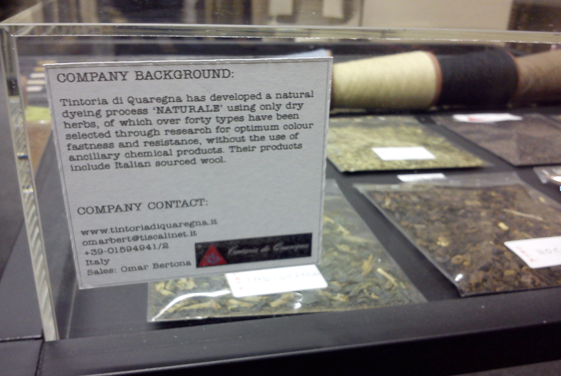 The Italian company Italian company – Tintoria di Quaregna also showed their newly developed natural dyeing process ‘NATURALE’ that uses only dry herbs chosen specially for their optimum colour fastness and resistance proven by their thorough research. 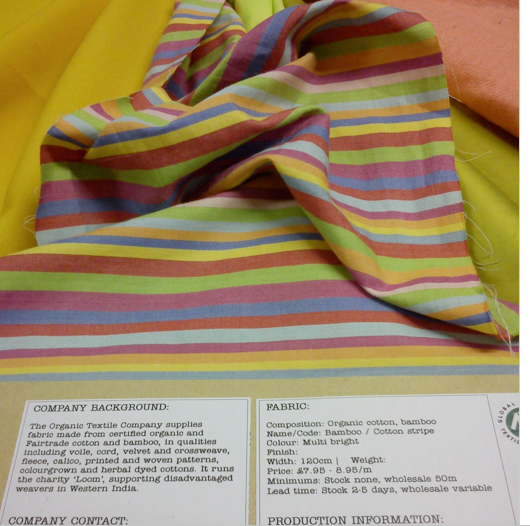 The company has developed over 40 different types of herbs that do not require any ancillary chemical products, making it a purely natural process and significantly decreasing the environmental impact of the dyeing process. 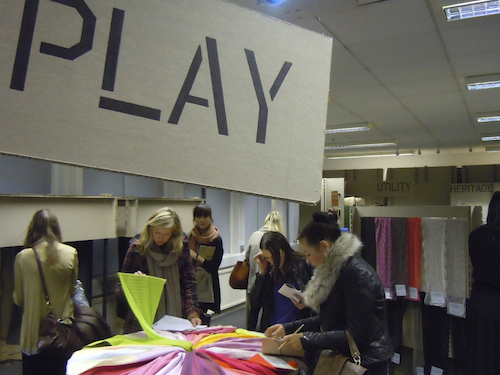 The companies showcased were from all over the world including a number of British wool and tweed companies. However unfortunately there were no African production companies, hopefully African companies will also one day benefit from the growing of this market. 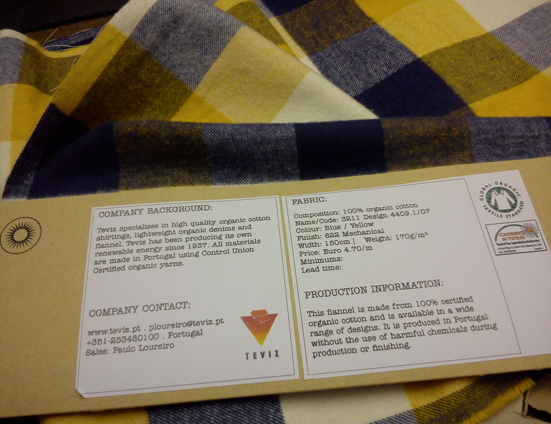 One area we thought could be of interest are the suppliers who used coffee into textiles in particular post-consumer coffee ground fabric by S.Cafe©. Most coffee grounds end up in mainly our landfills, which contributes to our overall solid waste management problem. 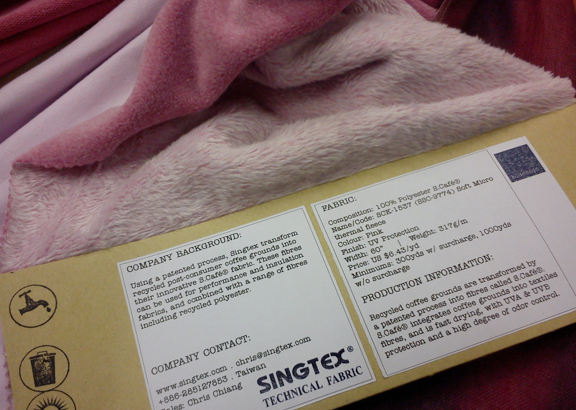 SINGTEX® are pioneers with this technology and reuse these grounds in their patented process that transforms the coffee grounds into S.Cafe®yarn, which they then produce into many styles of knitted and woven fabrics, as well as softshell fabrics S.Cafe® fabrics. Maybe a possibility for African countries? The team are interested to hear more on this area of African suppliers. If you are an African supplier of textiles do email us at info@africafashionguide.com and we can pass your details on to them for the next edition. 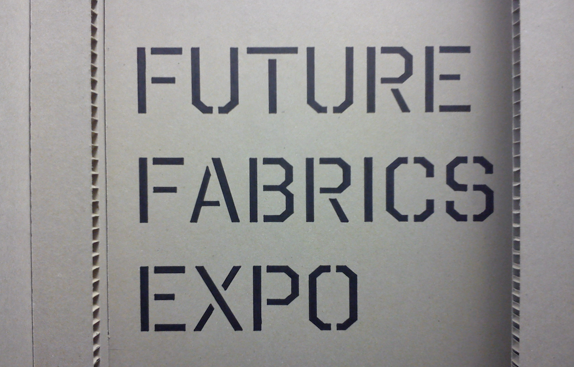 Charlotte tells us that “We were very pleased with the outcome of the first event and look forward to developing the Future Fabrics Expo.” Overall a well attended event with a showcase of interesting eco luxury fabrics and so we too are very much looking forward to the 2012 edition.